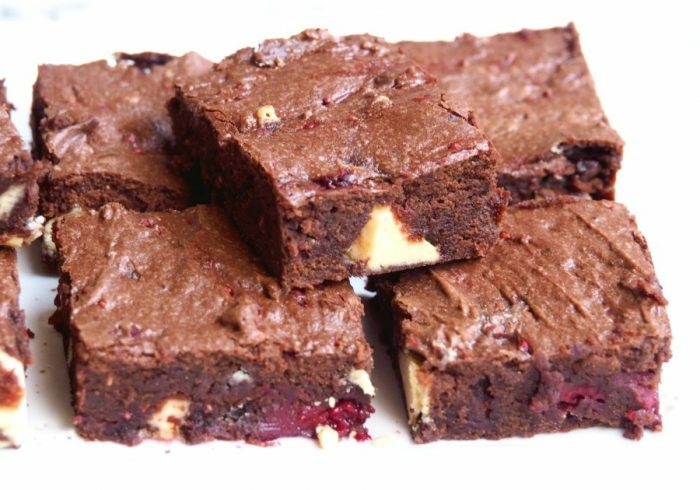 With an abundance of dark and white chocolate and a generous addition of raspberries, these brownies are both delicious and decadent. This is one of the first recipes I posted and it’s time for a long overdue makeover and a conversion to the Thermomix. 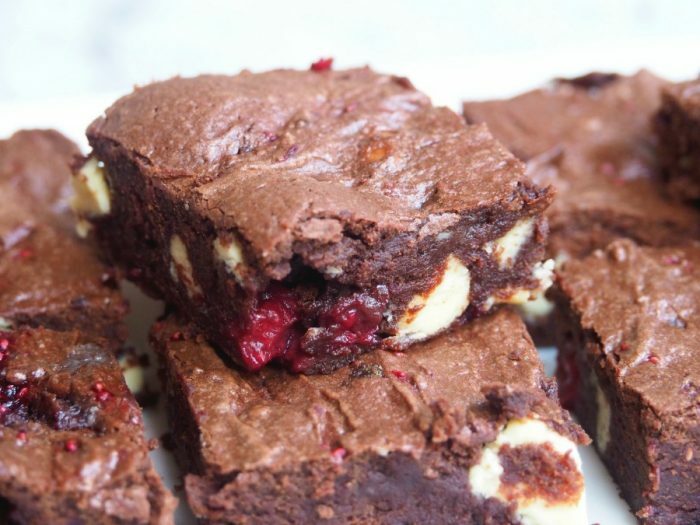 I’ve since tweaked the recipe, first swapping out caster sugar and using brown instead, and then reducing the sugar but with the lorry load of chocolate in the ingredients, I promise you won’t miss it. I chopped the white chocolate by hand because I love how it looks in the brownies, big, chunky and wholly irregular! 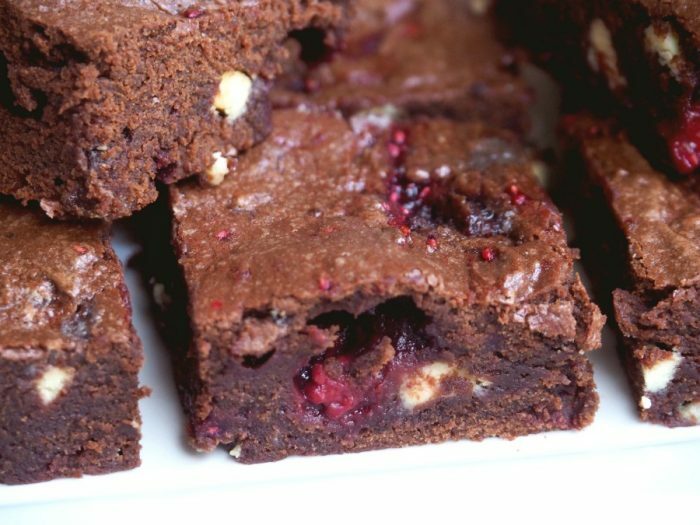 These brownies are super fudgy but if they’re cooked a little longer than you’d like, you don’t have to worry, because the raspberries make these brownies marvellously moist. You won’t believe this by looking at my pictures but I actually measure my brownies and slices with a ruler but I still can’t cut a straight line or an equal piece to save my life. 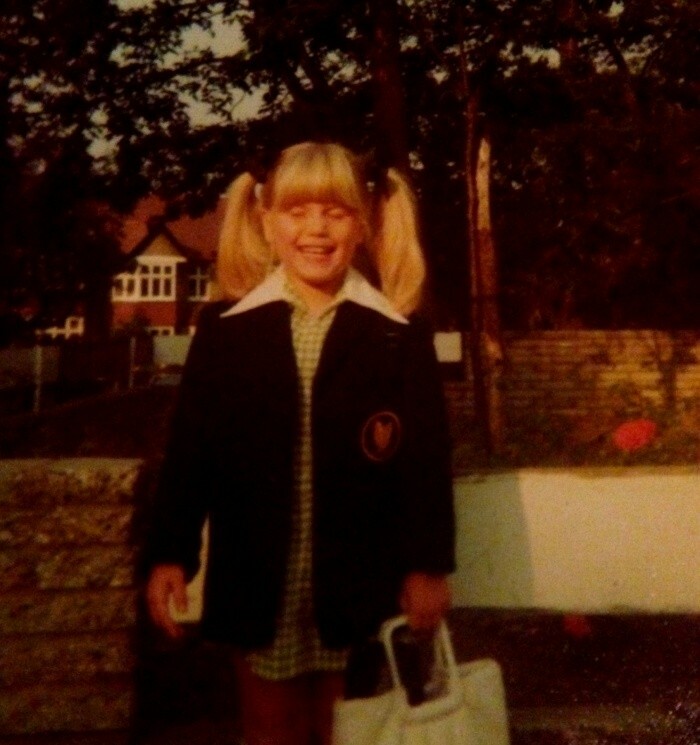 When I was in top infants, I was cutting out a picture (I can’t remember of what) and my mind was all a-wander as were my scissors, and my teacher Mrs Munday told me that I’d never be a good cutter. A few years later, she was my teacher in top juniors and she told me if I kept playing with my eraser, I’d never get the hang of fractions. I wonder if Mrs Munday had a crystal ball in her desk drawer because she was right on both counts, I can’t cut a straight line or do fractions to save my life. When I was cutting these brownies, I had a little chuckle to myself and thought, I wonder what Mrs Munday would say if she could see me now! I guess, it would be I told you so! Talking of maths, I’m not very good at measuring tins either so I made these in a large tray bake style tin. If you use a smaller/lamington tin, you’d definitely get a greater depth of brownie (I’m not that bad at fractions!) Whatever tin you bake these in and however well you slice these, unlike Mrs Munday you won’t be disappointed. Like Mrs Munday however, I can see the future and I promise you that you’re in for a treat! Can you remember your primary school teachers? What’s your favourite chocolate, milk, dark or white? Preheat oven to 180 C /160C fan-forced. Grease 20cm x 30 cm rectangular pan and line base and long sides with baking paper, extending paper over the sides to make handles. Stir dark chocolate and butter in a large heatproof bowl over large saucepan of simmering water until smooth and then stir in the sugar. Remove from the heat, stir in the eggs and the vanilla essence, then the sifted flour, raspberries and white chocolate. Spread mixture into the pan and bake about 25 minutes. The brownies will be done when the edges are pulling away from the side of the pan and the top is starting to crack. Cool brownie in the pan before cutting into squares. Place dark chocolate and butter into TM bowl and chop for 5 seconds on speed 7. Scrape down sides of bowl. Melt chocolate and butter for 2 minutes at 60C on speed 2 or until melted. Add the sugar, eggs and the vanilla essence and mix for 10 seconds on speed 4. Scrape down sides of bowl. Add flour and mix for 10 seconds on speed 4. Scrape down sides of bowl and mix for a further 5 seconds on speed 4. 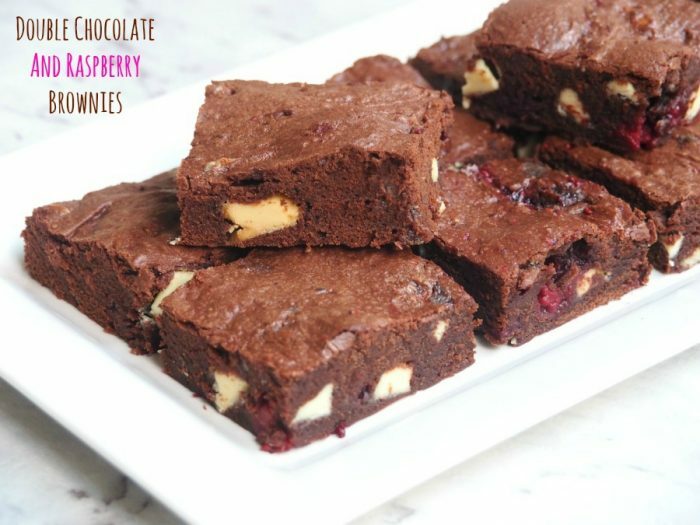 Add raspberries and white chocolate chunks and mix for 10 seconds on reverse speed 3. Using a spatula, fold through the white chocolate and raspberries by hand until well combined. TIP! Use the raspberries while they are still frozen for best results. 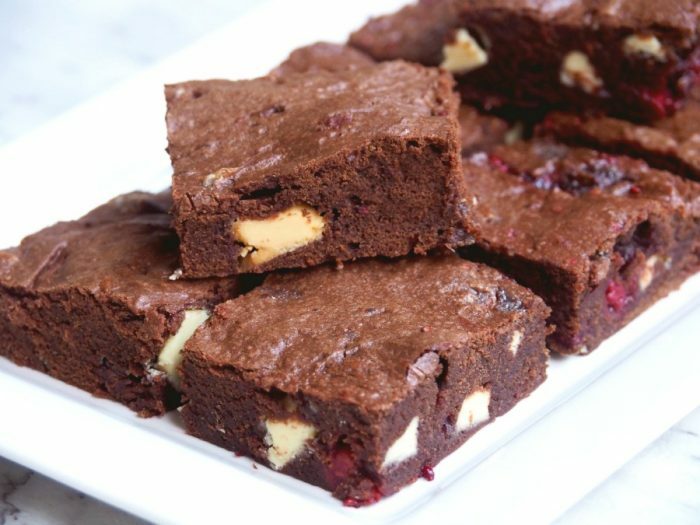 You can store these brownies in an airtight container for up to a week.